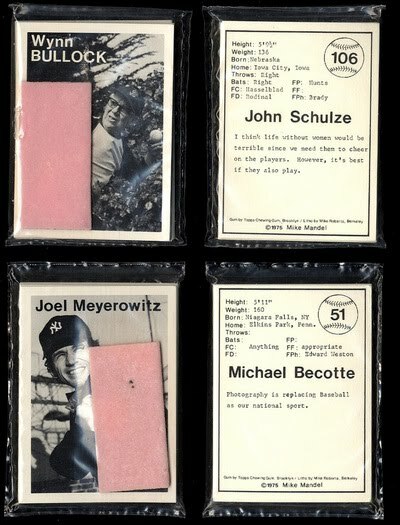 By now many of you have seen the article on Mike Mandel's photographer baseball cards in the current Aperture. This project (the whole set can be seen here) has a special place in my heart, not just because I'm a photographer but because as I was an avid baseball card collector as a kid. I still have them actually, sitting in boxes in my basement. Why do I hold on to such things? I think it goes to the root of being a photographer. My theory is that at least on some level all photographers are packrats. While others (some of them anyway) allow themselves to pass through life without attachments, photographers insist on collecting little bits of what's around us to carry along through life. Books, cards, mementos, a million other things, and of course photographs of what we've seen. [photography] is all about stopping time, possessing things, holding onto them. And you know, if my goal was to be a healthy person, photography would not be the thing. I have this joke about becoming a binoculographer: you go around and look at the world without photographing. That would be a spiritually healthy way of taking things in. But this wanting to possess it is not so healthy. I think he's right. I can barely walk past an interesting scene without wanting to possess it. And the urge goes beyond that, to the rest of life. Here I am dragging to my grave not only thousands of old baseball cards but a basement full of other relatively useless belongings. And that's not even dealing with the elephant in the room: My photographs! Maybe it's a healthy compulsion, maybe it isn't. But either way I'm running out of room. Which brings me to my proposition. I've got a large stack of 5 x 7 darkroom workprints (B/W images on RC paper, generally glossy) which for one reason or another have minor issues, slightly misexposed or easels off or wrong contrast or whatever. I'm tempted to put them into storage in my basement but before I do that, I'd like to offer them up to other packrats. I will package them up 80 unique pictures at a time and ship them anywhere in the U.S. for a nominal fee. I can't guarantee what the photos will be exactly, but I can give you my assurance you will find them interesting. I've weeded out the total losers. What's left is generally presentable enough to stick on a wall, or maybe to use as shims under a table or something. Best of all, I will top the whole thing off by including a stick of gum with the photos just like the old Topps cards of childhood. If you've ever thought about collecting stacks of small photos in your basement and dragging them to your grave, this could be the perfect opportunity! That should be a real bargain, even just to get prints you never saw before. I'm all set. A fun idea. I just placed my order. what would be postage to the UK? For international orders, just order twice ($9 should cover postage) and I'll ship one package. You have your first order from France. 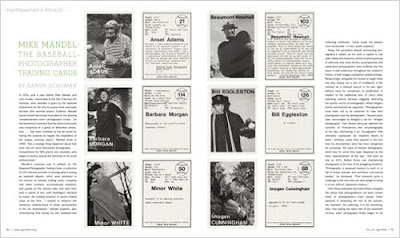 Thanks for the link to the Mandel trading card photos. I had no idea that there were that many. I had seen a few of the more famous ones, such as Siskind and 'Duke' Baltz but not the rest. It's really a snapshot of a very exciting time for photography and one has to wonder what happened to the majority of them - most are probably teaching somewhere, nearing retirement age. Could you scan them and Email them to me? Once that's done please burn the original prints. Finally, please send me a check to cover the amount of gum you would have shipped to me so I can source it locally. Do you still have any of these left? Wouldn't mind getting my hands on some. Robin (or whoever else might be reading), I have plenty to ship out and I am constantly making more so there should be an indefinite supply. You've heard of limited editions? Well this is the opposite. Anyone paying close attention might've noticed I had to raise the price slightly. Between Paypal commission and postage costs I was losing about $.80 apiece on the first batch. The price now covers all my costs. Sorry if that puts it out of reach for anyone. i'll be ready to order beginning of december, paypal and serbia don't mix well, so i have to wait for a friend to do it for me. is the 2xorder enough for shipping to serbia? Cheers. Put my order in. A good idea to get rid of work prints. Look forward to receiving mine in the post. "... is the 2xorder enough for shipping to serbia?" - same question again ... regards, Vlad. Sorry, I haven't been able to check Serbian postage yet. I will have an answer early next week after I visit the post office. I checked the post office. I can ship to Serbia for the same price. Thought your package arrived this morning with the prints in. But instead it was full of bags of sequins and no prints? Think you posted the wrong thing? Hi Robin, I'm not sure what's going on with this. Can you please email me directly and we'll sort it out. Brian Dyson: What Was He Thinking?